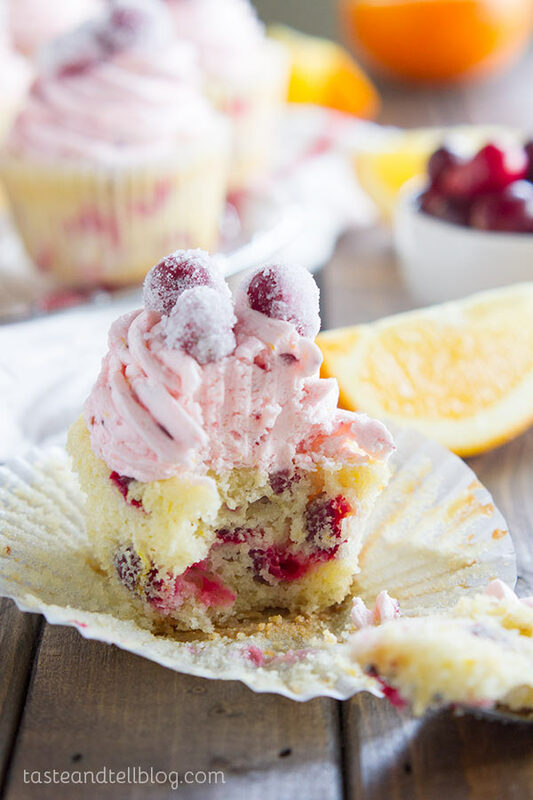 The perfect holiday cupcake, these Cranberry Orange Cupcakes are infused with orange zest and fresh cranberries, then topped with a silky cranberry orange buttercream. Make them even more festive by topping them with sugared cranberries. Maybe that’s not the right thing to call it – I don’t turn my nose up at people or at foods. I’m always willing to give everything a shot. I don’t eat only gourmet food or insist on only certain brands. Maybe calling myself a food critic would be more accurate. Let me explain. A few weeks ago, I went out to dinner with my sister, mom and sister in law. I was in a part of town that I don’t make it to very often, and this was right in the middle of me being stuck at home without a car, so I hadn’t even really been out of the house much. I had decided that before I drove home, I was going to go to one of my favorite cupcake shops to get a cupcake. Well, as I pulled into the parking lot of the restaurant we were meeting at, I saw that there was a different cupcake bakery right next to the restaurant. Well, that makes things easier, right?? The pickings were slim – only a few flavors to chose from. But they did have mini cupcakes, and I bought a cranberry orange cupcake, and another one that I can’t even remember right now. On my drive home, I opened up the bag and pulled out that cranberry orange cupcake. I was pretty excited – I had been craving a cupcake, and I was excited about the flavor combination. But I was quickly let down. It wasn’t that the cupcake was bad. It just wasn’t good. I knew that I had to go home and recreate my own version of that cranberry orange cupcake. 1st – I know this makes 14 cupcakes. It drives me crazy, too. You should have 12 or 18 or 24. Not 14, where you have a partially empty cupcake tin. But I wanted to keep the measurements simple, instead of having to do measurements like 1 cup and 1 1/3 teaspoons. Easy trumps the number, right? My normal cupcake recipe makes 12, but when you throw in the cranberries, it ups the amount of batter you have. 2nd – The texture of these cupcakes is more like a bakery cupcake than a box mix cupcake. 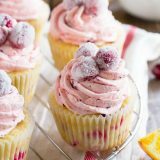 A lot of people get used to the light and fluffy cupcakes that you get from a box mix, but these cupcakes are not light and fluffy in that same sense. These are a lot more moist and flavorful, though. 3rd – The buttercream on these cupcakes gave me a run for my money. It looked perfect, and then I stirred in the cranberries and it all fell apart. The buttercream broke and was not pretty like I was hoping for. The first time this happened, I tried adding more powdered sugar, but all I ended up with was a super sweet buttercream that was still broken. What ended up working for me was first – beating it like crazy. Like I beat it on medium-high for 5-6 minutes straight. It still wasn’t perfect, so I took a kitchen towel and ran it under the hot water, then held it up around the outside of my mixer bowl. That did the trick! The little bit of heat brought it back together and I had a beautiful, fluffy buttercream. It was a little bit softer than I normally like, so after piping it on the cupcakes, I refrigerated the cupcakes to set up the buttercream a bit. It worked like a charm!! If you don’t want to deal with the buttercream breaking, feel free to leave the cranberries out of the frosting and you’ll have just an orange buttercream. 4th – for the cupcakes, I roughly chopped the cranberries with my knife. I left them in mostly big pieces, just making sure each cranberry was at least cut in half. For the buttercream, though, I put the cranberries in my Blendtec and pulsed a couple times to break them down more. You want the pieces small enough so that you can still pipe the frosting onto the cupcakes. 5th – The sugared cranberries. I love these things, and will eat them like candy. I first made them back in 2007, and I just had to make some more to top these cupcakes. 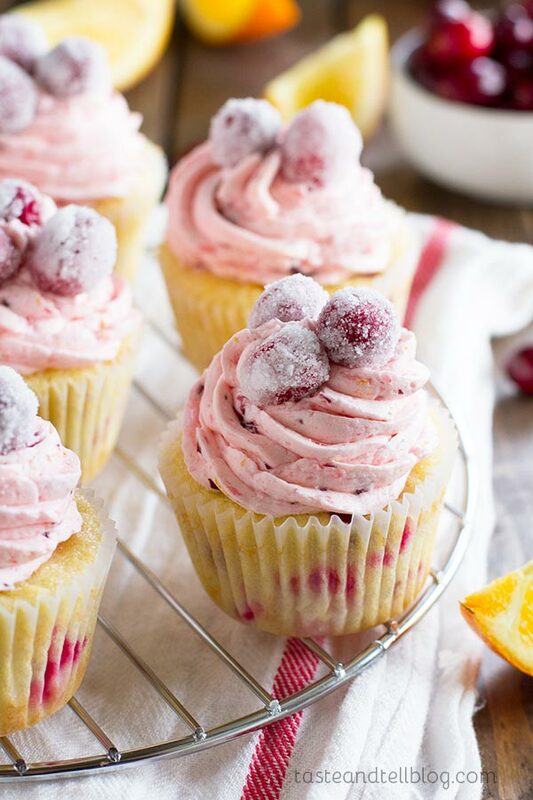 They don’t take a lot of effort, but you do start them the night before, so be aware of that if you choose to make them to top your Cranberry Orange Cupcakes. Whew – that was a lot. But do you know what? 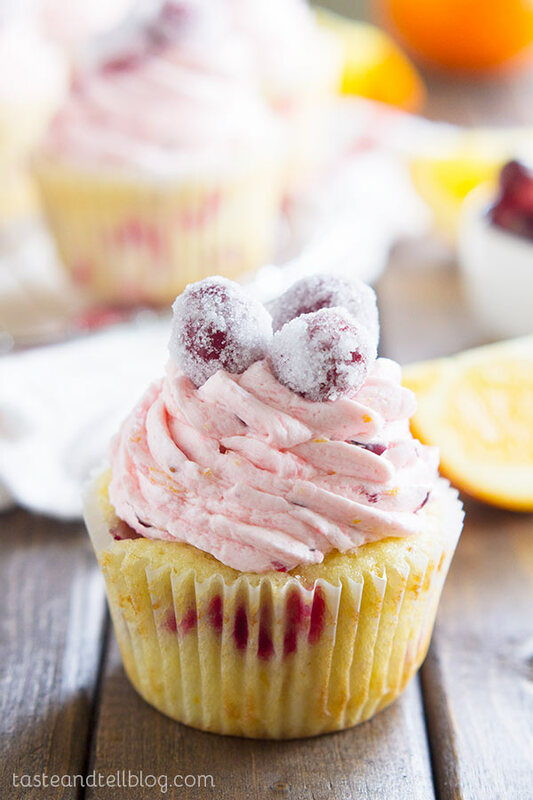 I have to admit that I liked these Cranberry Orange Cupcakes about 100x more than that mini bakery cupcakes I bought. And they would be perfect for any holiday party or get together. I know I love to celebrate the season with a good cupcake!! Combine the 1 cup of sugar and water in a small saucepan and cook over medium heat until the sugar is dissolved. If the water gets too hot and starts to boil, remove from the heat and allow to cool slightly, then add the cranberries. (You don’t want the cranberries to burst, which is why you don’t want the water too hot.) Pour the simple syrup and cranberries into a bowl and cover. Refrigerate overnight. Drain the cranberries. Place the superfine sugar in a shallow bowl and add the cranberries. Shake to coat the cranberries with the sugar. Transfer to a surface lined with waxed paper and allow to dry for at least 1 hour. Preheat the oven to 350ºF. 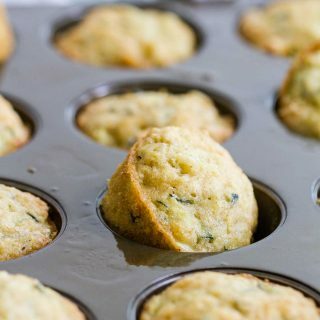 Line 14 muffin tins with cupcake liners. In a liquid measuring cup, combine the buttermilk and the orange extract. Add 1/3 of the flour mixture to the butter and beat until combined. Follow that with 1/2 of the buttermilk. Add another 1/3 of the dry ingredients, the remaining buttermilk, then the remaining flour mixture, beating to combine between each addition. 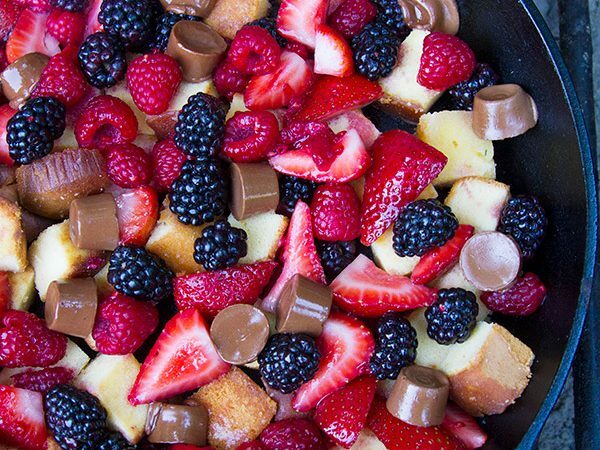 Fold the cranberries into the batter. Fill each of the prepared cups about 2/3 full of the batter. Bake until a tester inserted in the middle comes out clean, about 18 minutes. Allow to cool completely. Pipe the frosting on top of the cooled cupcakes. 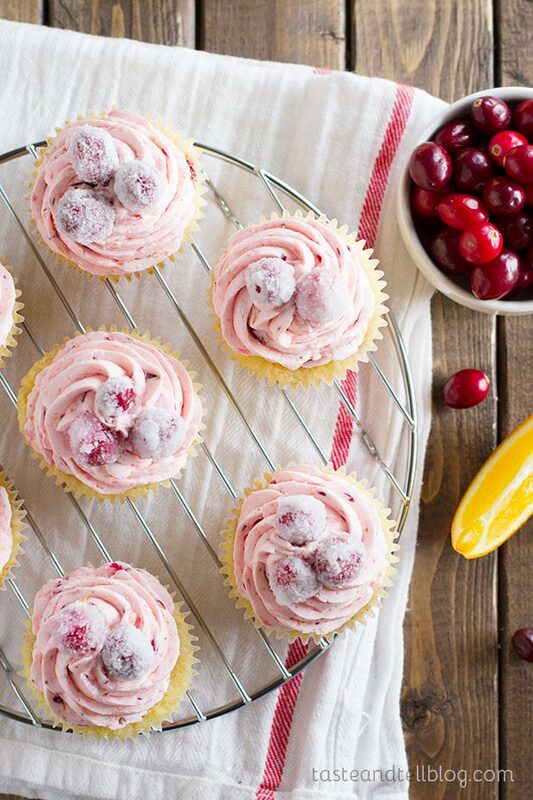 Top each cupcake with several sugared cranberries. Total time does not include cooling time. Time to make the sugared cranberries is not included. *If you don’t have superfine sugar, you can run regular granulated sugar through the food processor to break it down into smaller particles. 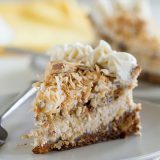 **regular milk can be substituted for the cream, but cream makes a richer buttercream, so it is preferred. ***When you add the cranberries, your buttercream may break – it will look like it starts to separate. This happens because of the acidity of the cranberries. If this does happen, continue to beat the buttercream on medium-high for 5-6 minutes. If this still doesn’t help, hold a kitchen towel that has been soaked in hot water on the outside of the bowl while the buttercream is being beaten. The heat should help the buttercream to come back together. If you don’t want to deal with the buttercream breaking at all, feel free to leave out the cranberries for just an orange buttercream. I love these so much! I am guilty of being way too critical of food too. It needs to be worth it if you’re gonna blow calories on a cupcake right? These look like they are well worth every dang bite! Those are beautiful! I love the sugar cranberries on top, such a wonderful touch! These are really beautiful! I had to comment wow! These cupcakes are stunning! I bet they are every bit as delicious as they look! Wow, Deb. Just…. WOW. These are incredible. Totally gorgeous and I’m sure they’re amazingly delicious!! 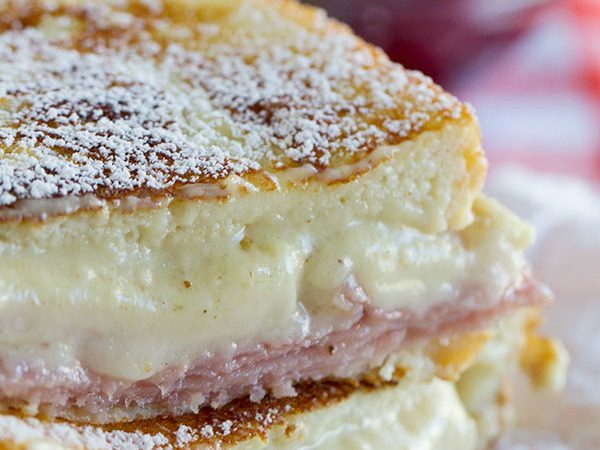 These look absolutely perfect with the sugared cranberries on top! 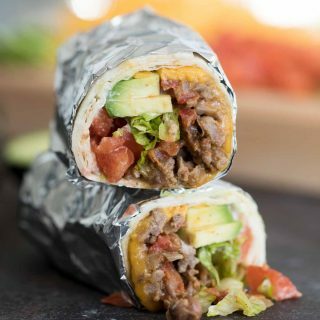 I’m with you, I turned into a “food critic” years ago and recently moved to Milwaukee which in my opinion has zero food scene compared to Scottsdale where I moved from. Everything I eat tastes like disappointment but I’m saving tons of money just cooking at home haha! What a beautiful cupcake! I hate to admit but I don’t like when cupcakes turn to be over 12 counts, for me that’s odd. So yeah, I hear you, Deb. I feel like as food bloggers we need to be slight food critics or snobs! If not, we would just accept any type of food on blogs, rather than being proud of them. These cupcakes are gorgeous and perfect for the holidays! These are too adorable Deborah! I love the candied cranberries on top! Beautiful! Thank you. Cannot wait to try. My mouth is salvating already. I’ve found that if my frosting is struggling to stay fluffy and together to trade out some or all as needs be with shortening. Seems to handle the added stuff better. Just don’t do too much because it will taste like shortening. And a good brand…preferably Crisco or it won’t work. Thanks again for the recipe. Can’t wait. Great suggestion!! And I agree – brand totally matters when it comes to shortening. I’m right there with you in food snobville. I can’t help it! Especially when it comes to desserts. No cupcake tastes better than a homemade cupcake, in my opinion. I love this fun cranberry orange combo! 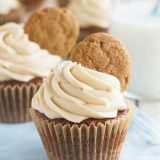 I’ve been thinking of making some cupcakes (I’ve never made them) and this recipe is the one, they might be delicious, and your pics are beautiful! These are seriously my favorite recipe of the season so far! So gorgeous!!! I just made these yesterday and they were incredible. Probably my new favorite cupcake! I did make a small oops. I accidently added a cup of butter instead of a half cup. I was worried it would mess up the recipe but they still turned out perfect! Thank you Thank you Thank you!!! I have an absolute favorite Cranberry-Orange Bread recipe (from America’s Test Kitchen) to which I add LorAnn Orange Oil. I made half as jumbo cupcakes with foil liners and half as regular size cupcakes. As I used previously-frozen cranberries, coarse pulsing in the food processor releases more fluid than fresh. In the frosting I used only 2T of finely-pulsed cranberries with their juice at the same time as the cream then added chopped, dried cranberries. Perfect texture and absolutely beautiful. Next time I might make a cream cheese frosting with the same flavors. Yum. These are the cupcakes that I will be making for Christmas Eve this year. Cannot wait to taste. LOVE the look!! Question? Salted or Unsalted Butter? And, does it make a difference regarding how they bake? I have a lot of salted butter, no unsalted. That’s why I am asking. Thank you. I always use unsalted, but you could use salted as well. You might want to cut back on the salt in the cupcakes by a pinch if you do use salted. i just made these for a Christmas church event and they were outstanding!! I received so many compliments on them! 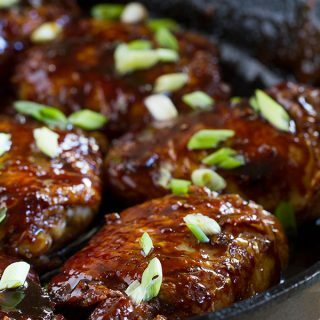 Thank you for a new go to recipe! Oh, you just made my night! I’m so glad they were a hit! I’m from Brazil, and here we do not have fresh cranberries only dried ones, how can I use them? I want to make these for my bible group tomorrow night! Thanks and lots so success!!! You could try to replace the cranberries in the cupcakes, and I’m guessing it would work, but I couldn’t say for sure since I haven’t tried them. I would try replacing the same amount, but don’t worry about chopping them. The dried cranberries won’t work in the frosting, but you could just keep it an orange frosting. Good luck! Thank you so much for this awesome recipe! I baked these recently and were very well received! I have even recommended your recipe to my baking groups. I love the zesty taste of the cupcake and I love the buttercream even more. The buttercream is so delicious, I can eat it on it’s own! I’m wanted to make these today but I didn’t realize you had to soak the cranberries overnight. Is there a minimum amount of hours I can soak them? Mmmmm. These were yummy! I made them in mini size so I pulsed the cranberries in the food processor to make them smaller. Also to help with the frosting staying together I used the fine chunks but also cooked some whole berries down in a little of the extra sugar syrup from the candied cranberries and smashed it into a thick purée and added that and some extra orange concentrate to the frosting. I’m also a big vanilla fan so I added some to both the cupcakes and frosting. They were delicious! You can check them out at Seastarcupcakes on Instagram! Love! I’m so glad they worked as minis! I haven’t tried frozen, but I would guess that they would work. This recipe is awesome. 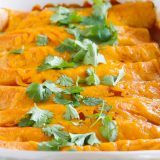 I wanted to make something different for the Christmas party at my husband’s job (police officer) and stumbled across this recipe. The good thing was I had everything I needed except oranges and orange extract, which he was happy to pick up. The results were amazing. 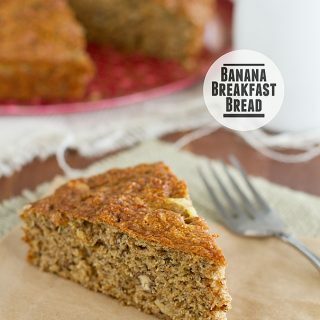 I took the advice in one of the comments and added a few drops of almond flavor…great idea. The batch made 18 cupcakes and I had quite a few sugared cranberries leftover, which I placed in mini cupcake cups as a garnish/snack. My husband took a dozen to the party and I dropped off half a dozen at my son’s orthodontist office. Everyone enjoyed them. I have a few comments to people who try this recipe. First, they don’t rise a lot so fill the cups at least 3/4. Second, they don’t brown on the top, so don’t fret or think they’re underbaked. Lastly, they are delicious. I’m so glad they were loved! Hi! These sound amazing!! Have you (or anyone else) tried using whole cranberry sauce instead of the soaked cranberries? Hello! I am making these for thanksgiving an am very excited! Does anyone have recommendations for baking in altitude? I live just over 6 thousand feet. Thank you! I’m not quite as high as you (about 4500 feet) and these work great for me. But whenever I make high altitude changes, I typically will slightly decrease the baking powder, slightly decrease the sugar, and slightly increase the liquid. I’ll usually also increase the temperature by about 25 degrees. The recipe says yeld 14 cupcakes, so I doubled it to have so I can have 28. Yeah, it made way more than what was needed it almost made 40 cupcakes. I just made this recipe and it’s wonderful. I love that the cupcakes themselves aren’t too sweet because the buttercream and sugared cranberries balance them. My only changes: clementine zest rather than orange, no orange extract (i didn’t have any) and I didn’t bother putting cranberries in the buttercream because it sounded like a pain. Very delicious, pretty and impressive even though they’re actually very easy! Will make again.